We offer a “turn-key” foundation repair solution for all foundation settlement issues. There are many causes of a cracked foundation. Your windows and doors may stop closing properly. Click here for more informational diagrams. If you notice these altercations occur feel free to contact us for a free estimate to determine if you have foundation settlement issues. We use custom concrete cylinders that are cured for 30 days to guaranteed there cured to 5000 psi. Each cylinder has a steel connector rod used to stabilize the press cylinders as they are pressed down. If problems do occur afterwards,we will adjust the foundation at no additional cost. This is backed by a lifetime transferable warranty. For a quick overview, read the steps below. 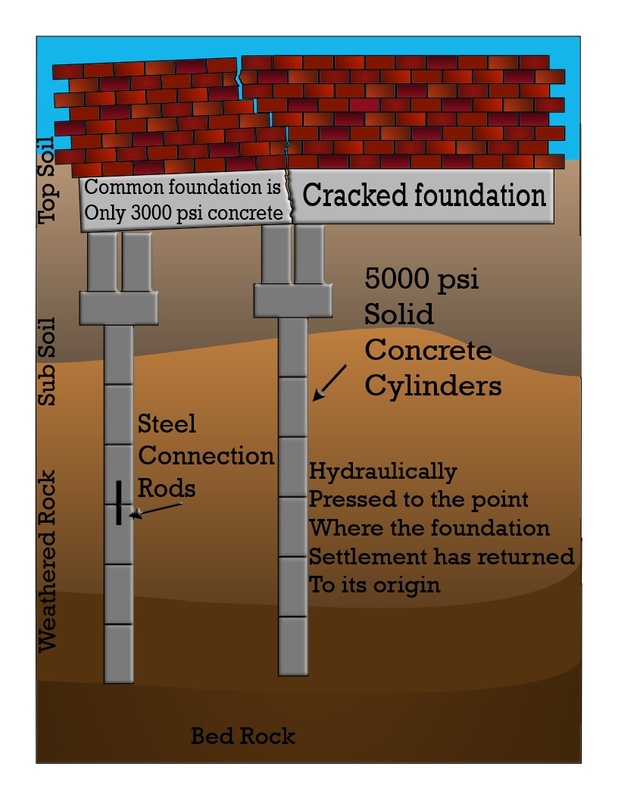 It is a short explanation of the seamless process that will correct the settling foundation. Altar site area to make sure any wanted landscape is safely removed before construction starts. Any hard surface blocking access points will be demolished. After site is fully cleared the digging will commence. Usual access holes will be 3 to 4 ft deep. Hydraulic pumps aid pressing in concrete cylinders that are set around a steel rod connector. The cylinders are inserted until sufficient depth is reached. They are then topped with a concrete cap block. Once the cap block is in place on all the cylinders, we begin to raise the structure. When the foundation is leveled we install custom cylinders with coated steel shims to keep the foundation from further settlement issues. Upon completion of the foundation repair, the soil is then returned to the installation area. As the soil is returned it is compacted to prevent any voids. For applications where poor drainage was a factor in the foundation damage,we correct the original issue to prevent foundation repairs to other areas of the structure. Please feel free to contact us with any questions or concerns. We are more than happy to explain this process and how the concrete pillars are the most sound solution to a settling foundation.